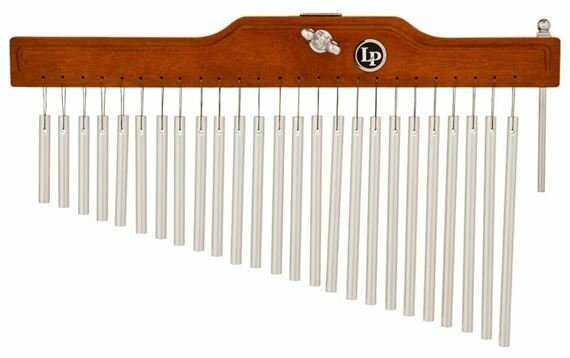 Shop Latin Percussion LP 449 Studio Chimes 25 Bars from AMS with 0% Interest Payment Plans and Free Shipping. The Latin Percussion LP 449 Studio Chimes are great for studio use or where shorter sustain and added control are desired. They feature 3/8 inch diameter, gold-anodized, aluminum alloy chimes that are strung with genuine Kevlar cord for added strength. A bar chime striker is included and fits conveniently into a storage slot in the top wooden bar. Stand not included. Passion. It is the force which drives all human beings to achieve, to strive and to make their dreams come true.The story of Latin Percussion, Inc. is the passion of one man. A passion which drove him to create, innovate and unmistakably change the face of percussion forever. In 1956 a young mechanical engineer and avid photographer from the Bronx named Martin Cohen happened upon New York's famous Birdland jazz club. He walked in and was greeted by the sounds of Cal Tjader's hot Latin jazz. Cohen was so taken by the infectious music that he became a regular at the Monday night jam sessions, which were headed by flutist Herbie Mann with percussionists like Candido and Jose Mangual. It was Mangual in particular who was an inspiration to Cohen. Up until then, there was no role model that exemplified greatness, Cohen said. That's what I saw in Mangual, and that's what I wanted to be, somebody who had that mastery of something. Cohen became a student of the 1960's Latin scene, and soon wanted his own set of bongos. It was then that he learned about the politics of Latin percussion. Because of the government-imposed trade embargo against Cuba, finding good instruments in the United States was a difficult prospect at best. This obstacle did not dull the passion of young Cohen, however, and he put his engineering skills to use and created his own set of bongos. Using photos of Johnny Pacheco's bongos, he created his first prototype. Of course, practice makes perfect, and this first attempt was not exactly flawless. This was the beginning of my learning, Cohen said. I knew nothing about machining or about wood or metal working. The first wood bongo shell was cut on Friday, and by Monday it was a quarter of an inch smaller. I didn't realize it was wet wood which was cut and that it had to dry first. Undeterred by this initial setback, Cohen was soon delivering bongos and cowbells to musicians in brown paper bags, soliciting feedback and using the Latin nightclubs as his research and development labs. Cohen's self-described love affair with Latin music led to a tradition still in place at LP; the needs of performing musicians are placed ahead of everything else. Eventually Cohen received a contract to make cowbells for Rogers Drums and continued to sell bongos on consignment. He made a set of claves for Charlie Palmieri and he designed wood blocks and sound effects for Carroll Sound. The influence of two prominent television drummers helped to widen Cohen's focus from the dance hall to the recording studio. Cohen met Specs Powell, the drummer with the Ed Sullivan Show and staff musician for CBS. Cohen recalls Powell telling him to get out of the Latin dance halls and into the studios where the real money was. Powell asked Cohen to make him a pair of bongos and also to create a bongo stand so Powell could play them standing up. Cohen fashioned a mounting system without having to drill into the shell of the drum, thereby keeping the tone pure. Powell was happy with Cohen's work, and introduced him to Bob Rosegarden, who was then the drummer for The Tonight Show. Rosegarden asked Cohen to create an instrument that would replicate the sound of the traditional horse jawbone with rattling teeth. Cohen's modern-day version of the jawbone, called the Vibra-Slap, became the company's first patent. Rosegarden also asked Cohen to make a more sturdy cabasa, as the traditional instruments were made from coconut shells covered in a fragile wire lattice. Using a textured material from the wall of an elevator rolled onto a cylinder, Cohen wrapped a bead chain around it and then attached a handle. This became the LP Afuche/Cabasa, the company's most successful patent. Innovation has always been a part of the LP story. In building his first patented instruments, Cohen used durable modern materials to replace rare and fragile instruments without sacrificing sound quality. Cohen was also one of the first manufacturers to build fiberglass congas, which gained favor with Latin dance bands because of their greater volume. Cohen's passion and sincerity helped him win acceptance in what was then a tightly insular Latin community. As a result, he became friends with many of the players he created instruments for and with. Carlos Patato Valdez is a lifelong friend of the Cohen family, and was a frequent visitor to their household. The King Tito Puente, another friend and endorser, recalls Cohen trying to learn the mambo at the Palladium. Martin was a lousy dancer, Puente laughed. But he was always consulting with us, trying to do the right thing, to get the authentic sound but with modern engineering. He never got commercialized. Puente and Valdez's willingness to work with Cohen have resulted in superior quality LP product lines that bear their names, as well as their stamps of approval. Cohen's hard work and determination paid off in August of 1964. Cohen worked his last day for someone other than himself, and officially started Latin Percussion, Inc. Cohen's passion was now his own company. However, the early days were not easy. Cohen's first workshop was his basement, with gas-welding taking place in a detatched and unheated garage. Early customers would walk into workshop and find Cohen wearting two coats and a sweatshirt while welding conga hardware. He also served as the sole photographer, copywriter, market researcher, salesman and janitor. Cohen's business and family life began to overlap almost completely. His wife, Marilyn, spent time with the export division and still works for the company as a consultant. Cohen's daughter Andrea, who taught herself typing at 8 to help prepare shipping labels, is now one of the company's managers. From the beginning, LP has let those who play their instruments do most of the talking. The company's first endorser was Afro-Cuban and jazz drummer Willie Bobo. Today, LP has over 500 endorsers, a list which reads as a veritable who's who of the music world. Musicians like Tito Puente, Patato Valdez, Carlos Santana, Giovanni Hildago, Armando Peraza and many more all use LP products. Because they are the best, their equipment must be the best as well. The company that started in the Cohen garage now has 80 employees at its corporate headquarters, including a staff of research, design and product developers that keep an ongoing stream of new products coming out. In addition, over 250 people are employed at the manufacturing facility in Thailand. What started as a small family operation has grown to become Latin Percussion, Inc., the world's largest producer of hand percussion instruments. Cohen's commitment from the beginning has been combining authenticity of sound with strong modern design. Today Latin percussion are played by professional musicians and people from all walks of life. Cohen himself still travels to clubs around the world, taking photographs and talking to musicians, gathering feedback from those who use LP instruments. It's been a long time since you had to violate embargoes to get a good pair of congas. Martin Cohen and the Latin Percussion, Inc. can take substantial credit for that. Such a beautiful sound! On my first jam session I discovered my style of caressing this incredible musical addition to my world sound collection. It’s magnificent. The tones easily blend into and enhance every song. It’s a must have for beautifully polished works of musical art! Best addition ever. These chimes provide a added element to worship music for our church. Only problem is as the drummer I can barely hear them, I dont know if thats because a lot of drummers are naturally deaf after a while or what. People in the crowd state they can hear them, but I cannot.